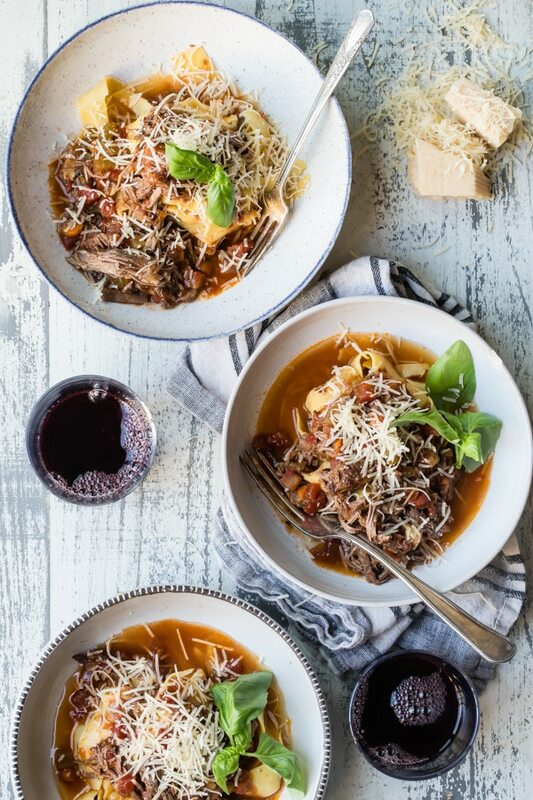 A beautiful and effortless Northern Italian recipe, this Slow Cooker Beef Ragù with Pappardelle is warm and welcoming after a long day at work. Slow-braised beef, tomato, carrots, onions, and a hint of red wine cooked until it practically melts over the noodles–there’s no better way to eat. 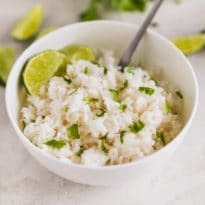 Not only will this dish will make your house smell amazing, but the people who eat it will start wondering aloud when you’re opening your own restaurant. Not if, when. It’s that good. 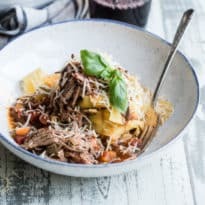 This tender braised beef ragù is rustic but somehow sophisticated enough to have in a tiny trattoria, especially if you finish it off with a generous dollop of soft butter as you give the pasta a final toss in the sauce. That’s the secret to great restaurant food, after all—butter, and lots of it. This recipe uses a slow cooker, but I include Instant Pot directions, too, down below. 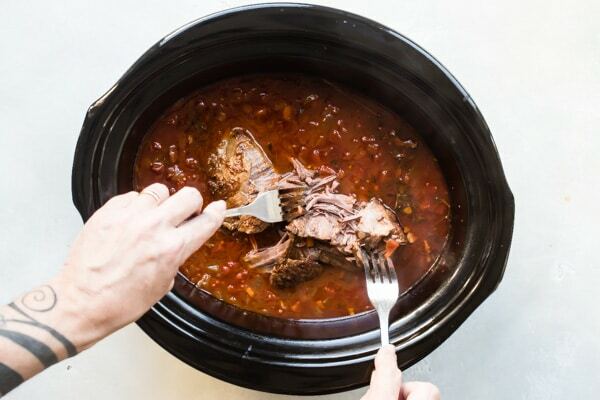 Get the sauce started in a Dutch oven in the morning—the pot browns the beef better than a crockpot does—and let the whole thing slow cook while you’re out running errands. The meat will be falling apart and so tender, I promise. All you have to do it boil some pasta water and prepare to swoon. Making Slow Cooker Beef Ragu for a super simple yet elegant dinner party? Click and slide the number next to “servings” on the recipe card below to adjust the ingredients to match how many you’re feeding—the recipe does the math for you, it’s that easy. 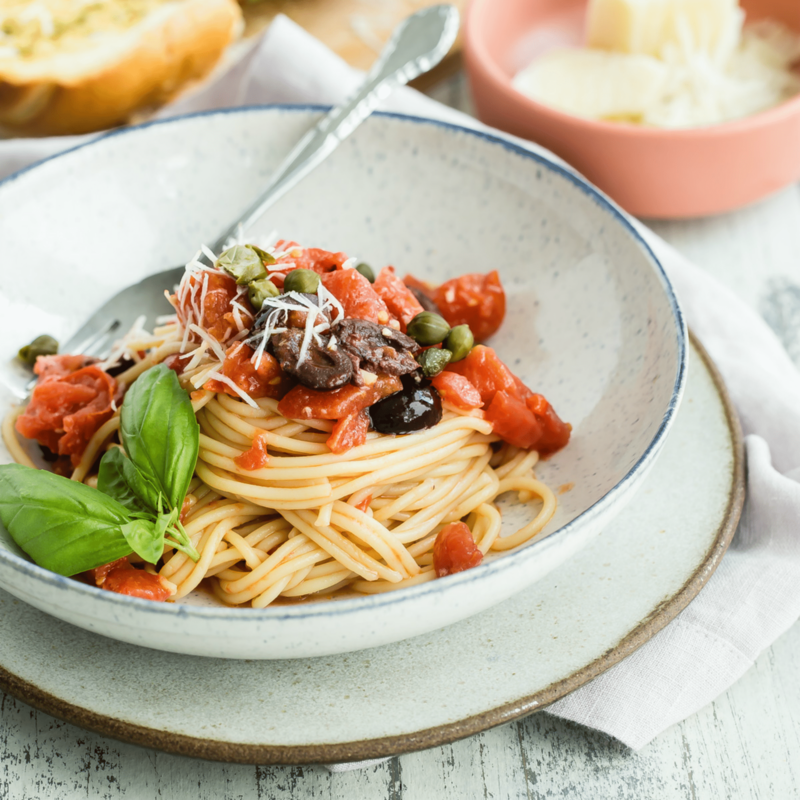 Unlike the popular jars of tomato sauce lining the grocery shelves, a proper ragù is a meat-based Italian sauce with only a small amount of tomato added to it. The meat can be anything, really: veal, beef, lamb, pork, elk, or venison. 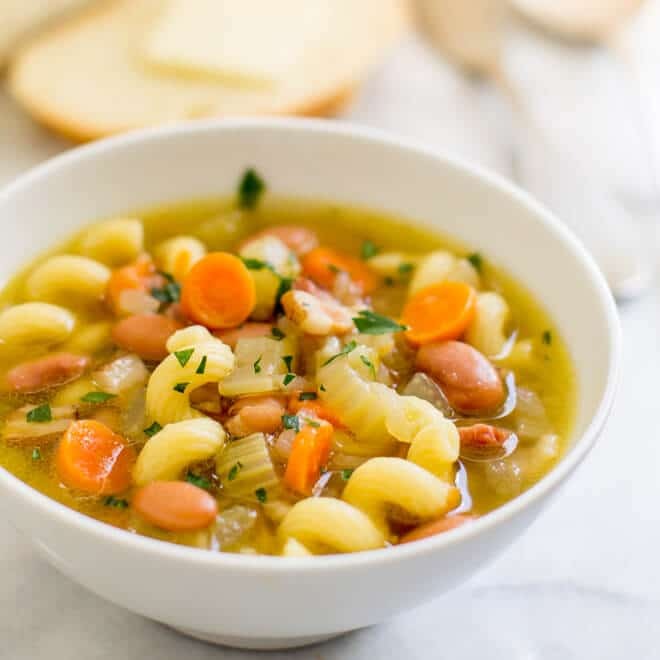 It’s slowly simmered with a mixture of carrots, garlic, celery, and onions. Wine and tomatoes are added to the mix, and everything is allowed to cook for hours until ready. Ragù alla Bolognese, also known as Bolognese sauce, is simply a variation of a traditional ragù and uses white wine and usually a lighter protein: chicken, veal, rabbit, or goose. When I was learning how to cook, this was one of the first things I made, inspired by one of my favorite Italian grand dames, Marcella Hazan. 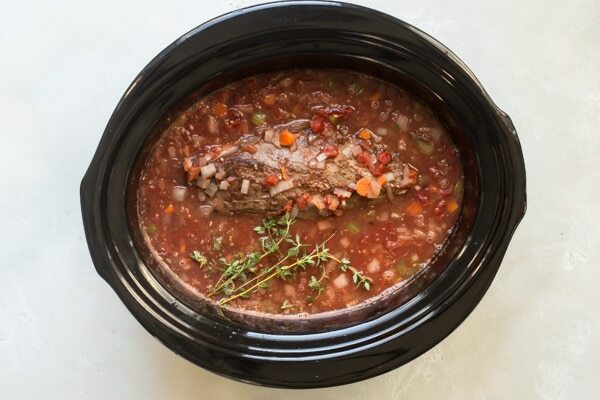 I knew this classic dish would be perfect for a crockpot. Eight hours of hands-free, slow simmering, here we come! What kind of beef can you use to make beef ragù? In true Italian form, you don’t need expensive ingredients to make delicious food. Inexpensive roasts and cuts of meat make the best candidates for this sauce. Beef shanks, lamb shoulder, pork shoulder, chuck roast—even oxtail. You can make a ragù with ground meat, also, but I prefer to find a big hunk of beef chuck. I wouldn’t recommend using stew meat; the chunks were tender, but the meat stays in chunks even after cooking. Beef roast, on the other hand, practically falls apart. 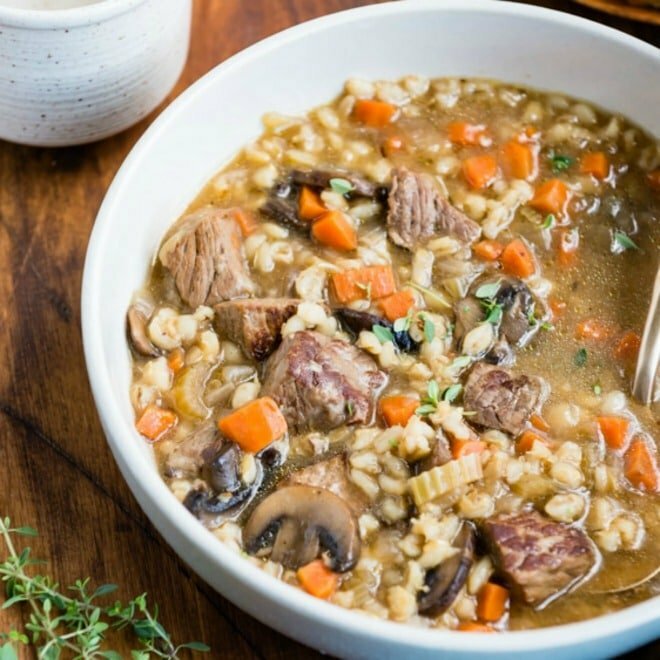 Can you make Slow Cooker Beef Ragù in the Instant Pot? I see no reason why you can’t make this slow cooker bolognese in an electric pressure cooker. Once everything is in the Instant Pot, close the lid and set it to the meat/stew mode, then set the timer for 40 minutes. When the cooking time is finished, leave the steam valve on natural release and wait for it to release the steam on its own, about 10 minutes. Open the lid and remove the roast to a cutting board and shred with two forks. Return the beef to the sauce and allow the sauce to thicken, pushing the sauté button if necessary to continue cooking. What is the best pasta for Beef Ragu? 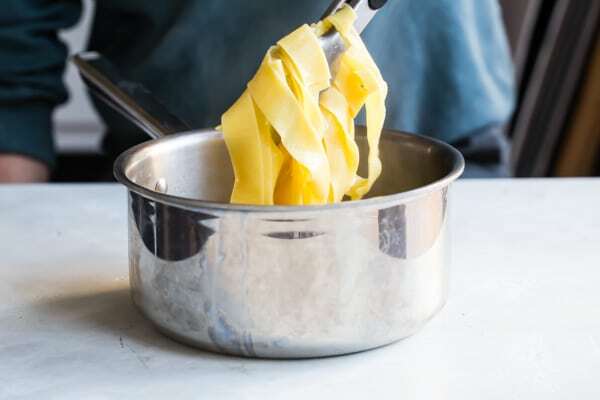 I appreciate pappardelle because it’s a lovely, wide, flat noodle that the sauce just sort of slips into, like a favorite sweater. If you can’t find it, fettuccine works well, too. Homemade cornmeal polenta or gnocchi would be wonderful with an Italian beef ragu, if you’re feeling up to it. If you’re watching your carbs, try zucchini noodles or roasted sweet potatoes. 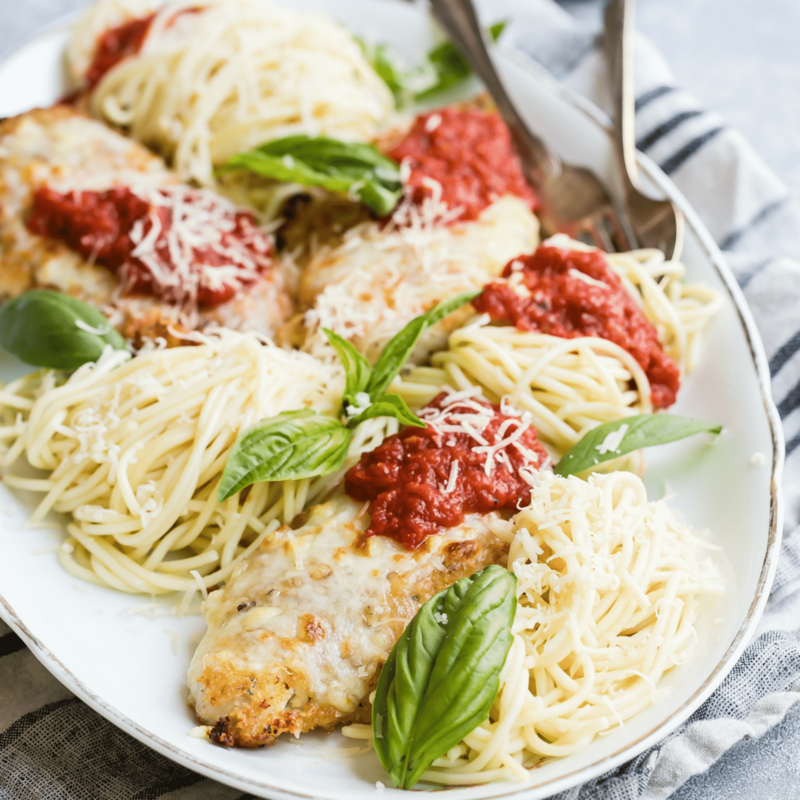 If you’re eating gluten-free, look for your favorite brand of gluten-free pasta to make this dish. 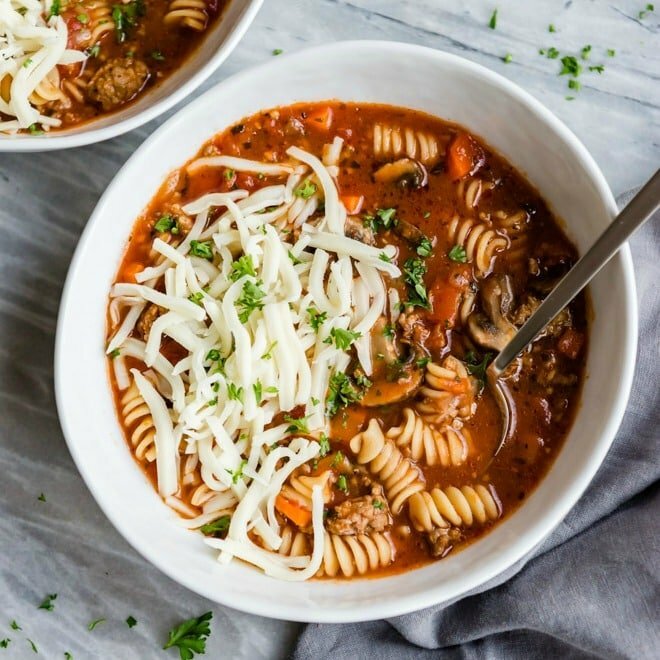 Can you freeze Slow Cooker Beef Ragu? On its own, this slow-braised sauce is absolutely perfect to freeze for ultra-busy nights when cooking just isn’t an option. I stack up small containers of sauce in the freezer and pull them out when I’m craving a made-from-scratch Italian meat sauce for dinner. Or just in case I decide to open that restaurant! 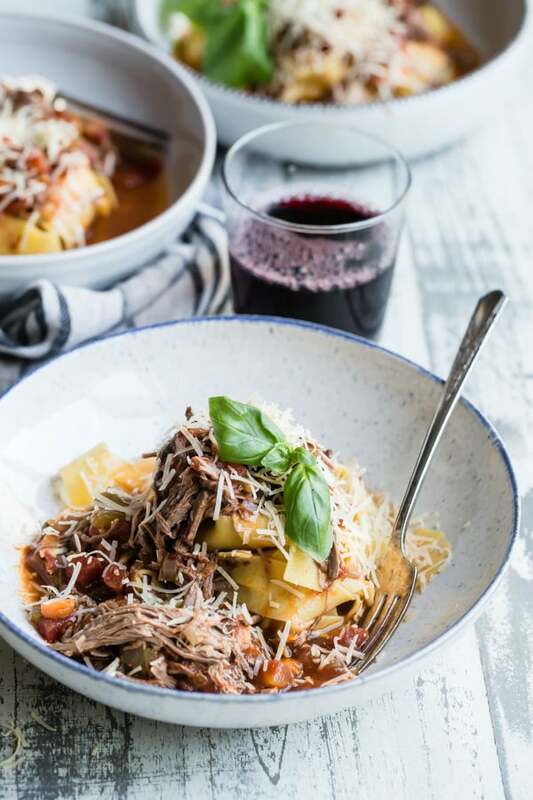 A beautiful and effortless Northern Italian recipe, this Slow Cooker Beef Ragù with Pappardelle is warm and welcoming after a long day at work. Slow-braised beef, tomato, carrots, onions, and a hint of red wine cooked until it practically melts over the noodles--there's no better way to eat. In a Dutch oven or large stock pot, heat the olive oil over medium-high heat until shimmering. Sprinkle beef generously with salt on all sides. 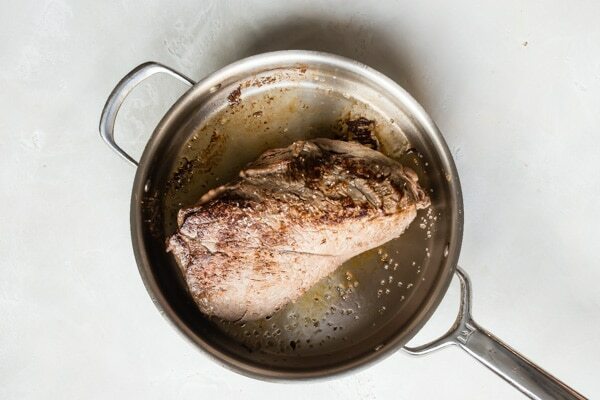 Add to pot in a single layer and sear without moving until a dark brown crust forms on one side, about 5 to 6 minutes. Flip meat over and continue browning on the second side until a dark crust forms. Remove from pot and transfer to slow cooker. Swirl the pot to make sure there are at least 2 tablespoons oil and/or rendered fat. If not, add 1-2 tablespoons more. Add onion, carrots, celery, and a pinch of salt and scrape the browned bits off the bottom of the pot (aka delicious flavor). 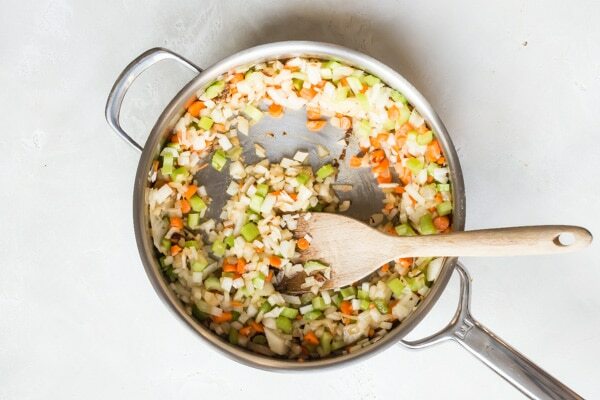 Continue cooking, stirring occasionally, until vegetables are soft, about 5 minutes. Stir in garlic until fragrant, about 30 seconds. Stir in crushed tomatoes, broth, wine, tomato paste, fennel seeds, red pepper flakes (if using), and thyme. Bring to boil and transfer to slow cooker. Cover and cook on HIGH for 4 to 6 hours or LOW for 8 to 10 hours. Remove bay leaves and thyme stems (if you used fresh sprigs). Shred meat with two forks. Season to taste with salt and pepper and keep warm while preparing pasta. Bring 4 quarts water and 1 tablespoon salt to boil. 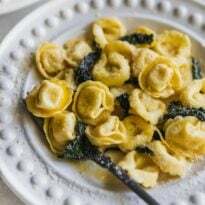 Add pasta and cook according to package directions, about 3 to 4 minutes for fresh pappardelle or 6 to 8 minutes for dried. Stir occasionally to separate the noodles. Remove 2 cups of pasta cooking water from pot, then drain well. Add drained pasta back to pot. Add sauce and toss to coat, adding pasta cooking water as needed to make the sauce the consistency that you want (start with 1/4 cup if desired and see what you think). Serve with parmesan cheese and fresh basil or thyme if desired. Absolutely delicious…! My family all had seconds…! 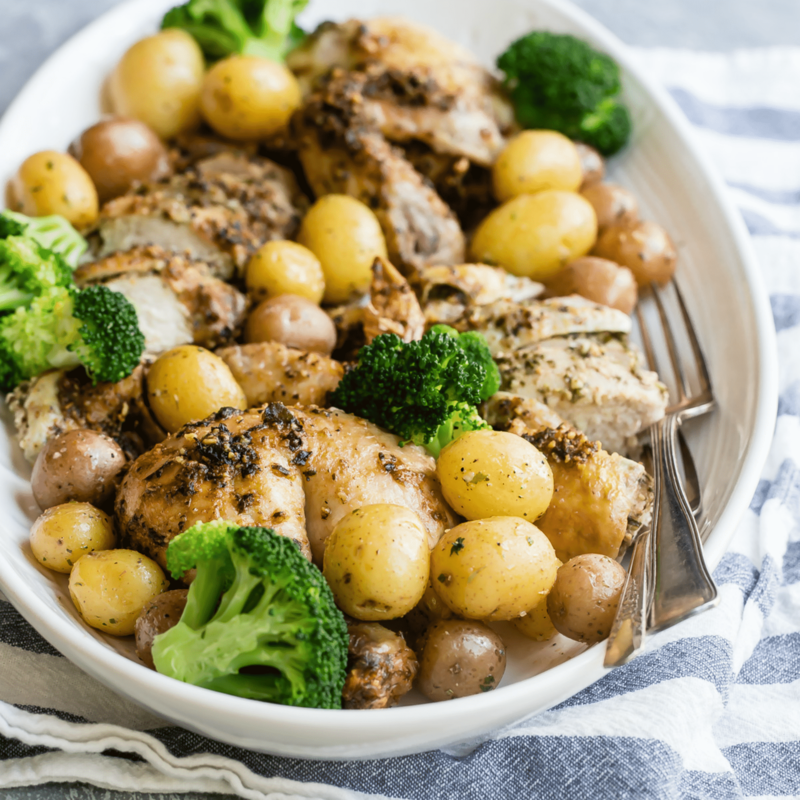 It will be added to my dinner rotation for sure…! Thanks so much!! !